Safescape is one of Australia’s leading companies in innovation and safety in mining, In 2017 Safescape commenced the commercialisation phase of Edge Protector (EP), designed by Steve Durkin, Safescape’s Managing Director. 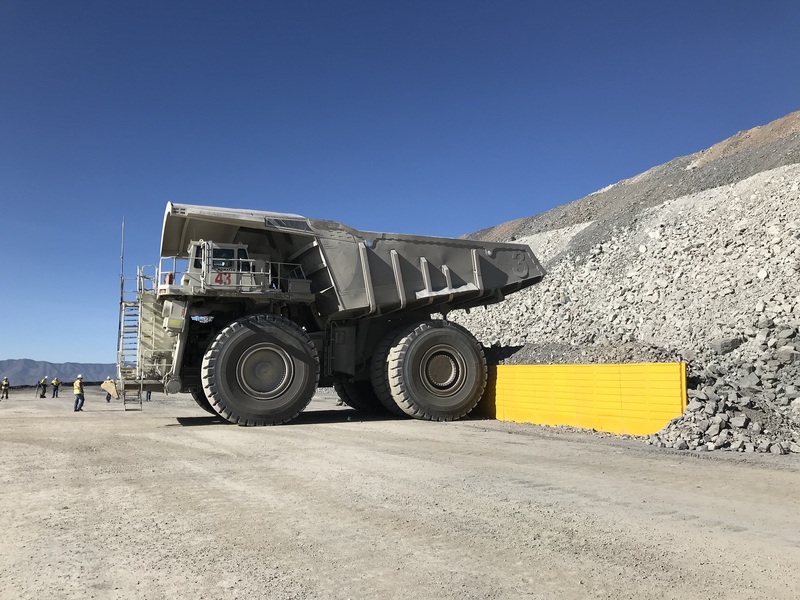 Safescape developed Edge Protector to challenge the status quo and provide a solution that provides a safer, more effective option for bunding for mines in Australia and internationally. 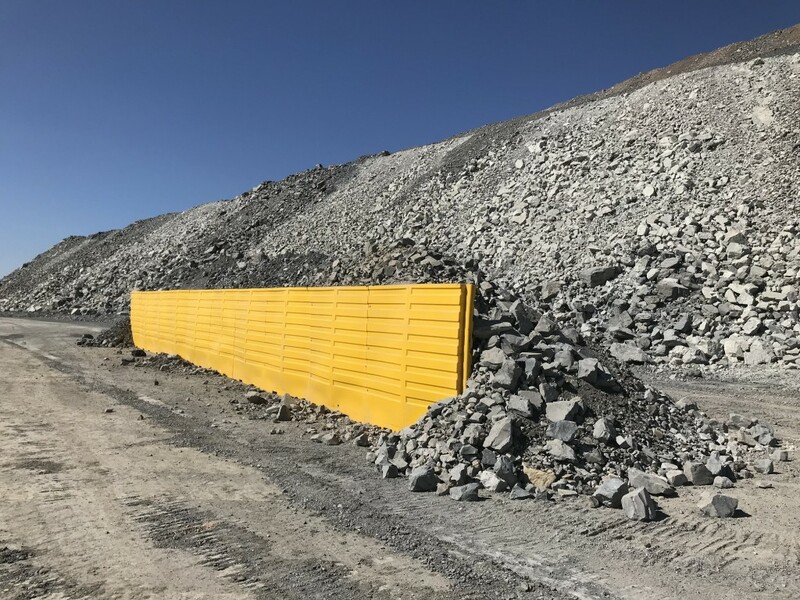 In November 2017, Safescape trialled the Safescape Edge Protector (EP), an original system for improved edge protection in open pit mines, at Goldcorp Peñasquito Mine in Mexico. The Safescape Edge Protector (EP) is made from a series of polyethylene shells which secure together in a row along the edge of an open pit road. The created wall acts to support a bund of loose rock giving a vertical face. EP is designed so as to prevent truck’s tyres from rolling up the bund. Each shell connects together to create a firm wall. EP is a composite structure with stiff engineered fill surrounded by a long lasting and brightly coloured polyethylene shell. This ensures the product is strong and stable, but light to move making it easy for mines to rearrange as needed. EP provides an engineered structure that reduces the likelihood of trucks penetrating a bund and while doing so reduces the width taken up by the bund. This reduced stripping ratio afforded to new ramps has a huge impact on the economics of mines. Where used to widen bottlenecks in existing ramps the benefits are increased safety and productivity. The improved level of safety and economic benefits that EP offers is what attracts large-scale operations such as Goldcorp’s Peñasquito Mine. Safescape joined team members from Peñasquito Mine in December to test the mathematical model that supports EP. The objective of the trial was to accurately demonstrate how EP provides an engineered structure that reduces the risk of a truck breaching a bund. The mine truck used to complete the task was an empty Komatsu 930E model, weighing 215 tonnes. The truck collided with EP bund structure at 5 km/h in reverse. Safescape calculated the theoretical penetration distance to be 16cm. After the collision, the berm movement from its original position was approximately 17cm. EP successfully prevented the truck from penetrating the bund structure rendering the test results consistent with the mathematical model of the Safescape Edge Protector. Prior to the creation of EP, open pit mining operations traditionally relied on mounds of dirt and rock to provide edge protection on haul roads. Rock bunding does not provide adequate protection for trucks, with the results often being catastrophic, resulting in loss of life and destruction of machinery. Despite the number of accidents as a result of inadequate bunding, rock bunding has continued to be the only solution until now. Rock bunding does not provide adequate protection for trucks, too often resulting in injury to personnel and damage to equipment, or in more serious cases loss of life and destruction of machinery. We would like to take this opportunity to thank the team at Peñasquito for the opportunity provided to us in the testing of this application for their site. Introducing innovative products to the mining industry is challenging. While many mines understand their challenges and would like to lead change, in many cases their corporate risk aversity minimises the opportunity for change regardless of the advantages. As a result they become more likely to stay with conservative solutions until more progressive organisations in the industry provide the data they require. Peñasquito’s proactive approach in trialling this innovative, new to industry product as a solution to a challenge on their site not only benefits them but also provides benefit to those waiting to be the first to be second. The Safescape EP is a new direction for the Safescape team and is targeted to improve the safety and efficiency of the open cut mines globally. It’s time your mine had the Edge!